The ScreenBeam Mini2 Wireless Display Kit wirelessly mirrors all your favorite content and productivity apps from your Windows 7/8 laptop, PC or tablet to a high-definition TV, without a Wi-Fi network or wireless router. Working closely with Microsoft, Actiontec optimized the ScreenBeam Mini2 Kit for legacy Windows 7 and Windows 8 devices. So if you have a device running Windows 7 or 8, you won’t miss out on the power and entertainment that wireless display delivers! The ScreenBeam Mini2 Kit is guaranteed to provide the best wireless display performance and is designed to deliver a seamless extension of the Windows experience. With ScreenBeam Mini2 Kit, users beam their favorite videos, photos and movies to the best high-definition display in the house. Simply connect the compact ScreenBeam Mini2 receiver to a high-definition TV, then plug the ScreenBeam USB Transmitter 2 adapter into your Windows 7/8 device. The adapter enables wireless display from legacy Windows devices that lack native Miracast™ support, the global standard for wireless display. Now sit back and enjoy movies and shows from Netflix, Hulu, Amazon, or YouTube on a big display. Share vacation photos and videos with the entire family, without ever having to huddle around a tiny screen again. ScreenBeam Mini2 Kit contains everything users need to create a Miracast-enabled, point-to-point connection between the device and the room display. Move heavy video traffic off the network, saving valuable bandwidth. A wireless dedicated connection means no crashing, lag times, and choppy or freezing video, while delivering professional display quality and very low latency. 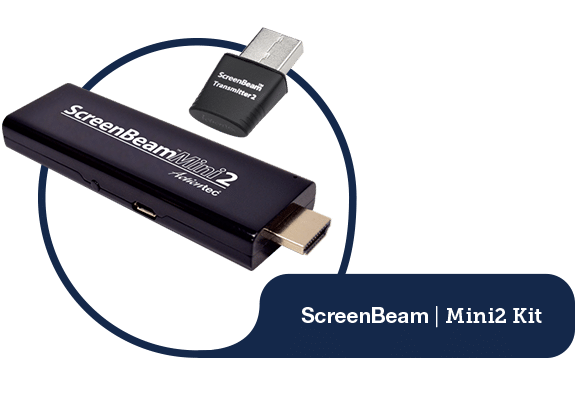 Simply connect the compact ScreenBeam Mini2 device to a high-definition TV, then plug the ScreenBeam USB Transmitter 2 adapter into your Windows 7/8 device. The adapter enables wireless display from legacy Windows devices that lack native Miracast™ support, the global standard for wireless display.